Here are printable materials and some suggestions to present letter G. The presentation ideally should be part of goose themed activities and/or crafts. A goose is a water bird that looks like a duck but is usually larger, with longer neck and legs and a more pointed bill. Some geese are raised by farmers, and some are found in the wild. The young is called a gosling, and the male is called a gander. Print a letter G coloring page in Standard block or D'Nealian font and a goose coloring page behind it or on a separate page if using paints to decorate later. Discuss other letter G words found on the activity worksheet. Children can trace and color the letter G's. After completing coloring the letter, encourage children to color the image. Write the word goose on the finished coloring page. Letter G words: Letter G Worksheet and Mini-Book (hard g sound) can be used as part of Letter G program of activities to reinforce letter practice and to identify related A words. Read suggested instructions for using the worksheet and mini-book. Finger and Pencil Tracing: Using your selection of worksheet, trace letter G's in upper and lower case with your finger as you also sound out the letter. Invite the children to do the same on their coloring page. Encourage the children to trace the dotted letter, and explain the direction of the arrows and numbers (on the upper right corner) that help them trace the letter correctly. During the demonstration, you may want to count out loud as you trace so children become aware of how the number order aids them in the writing process. 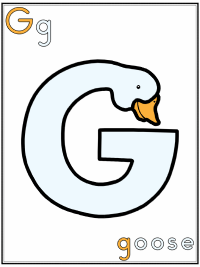 Letter G Word Search & Handwriting Practice: The four and eight word search game features the goose and letter G words with pictures and handwriting practice. 1. Print your choice of printable lined-paper. Have children draw and color a goose behind the lined paper or select and print a goose coloring page to color after writing practice. 2. Drawing and writing paper: encourage children to draw and color a goose and practice writing letter G g.